Band Websites: Are They Necessary? With so many social media platforms to choose from, it can be hard to keep track of all the websites, blogs, and profiles to create for your band. Some might argue that a profile on XYZ’s site is enough. We disagree. While it’s true that social media sites are useful and important tools for connecting with fans, they shouldn’t be your main focus. Why? Well, first, the popularity of these sites is constantly shifting, and new sites seem to pop up daily. (Maybe not daily, but still.) How many profiles can you manage—five? thirty? seventy?—before becoming overwhelmed and losing track of them all? And when the sites your profiles are on fade from popularity or shut down altogether, how will you communicate with your fans? In the battle for social media platform dominance, having your own independent website gives you stability and your fans a consistent place to find you. Second, relying on third party social media sites means you have no control over who sees your messages and when. It’s becoming increasingly harder, and more expensive, to make your voice heard over the noise, even by those who actively sought out your profile or page and want to hear your message. Third, a profile or page isn’t the most professional way you could present your band or yourself as an artist, since just about anyone can create an account. On the other hand, a dedicated website shows professionalism and a level of commitment that profiles just don’t. When a label, promoter, or booking agent wants to look up your band, they want to look at your website. When the press refers to you, they will want to direct people to your website. So, what’s a musician with no web design experience to do? Read on for more information. Remember when the internet looked like an online phone directory, where one-page websites simply showed a brief company description, list of services, their contact information, and—if you were lucky—a photo or two? That kind of web site doesn’t cut it anymore. Your band’s website should build a relationship between you and your fans. This means it must be informative, interactive, and up to date. Yes, your website should tell them about your band and display your discography. It should also give fans a place to listen to your new releases, watch your videos, and buy your music, and it should share your stories from the road and announce upcoming concerts or tours. Ideally, your website will also let you gather your fans’ information so you can continue communicating with them. There are other features you could add, but that’s a pretty good starting point. Of course, simply having these features isn’t enough; a tour schedule with nothing filled in won’t fill seats at your shows, and not adding new videos, music, or blog entries means there’s nothing new for your fans to see. Effective websites need a steady stream of content flowing into them. Now that you know what you want to offer, you need to find a way to offer it. If you’re an independent musician struggling to make ends meet, you probably don’t have a huge budget for web design. It’s equally likely that you aren’t an experienced web designer or fluent in CSS or HTML5. Even if you do happen to be the rare independent musician/code-writing web designer, you probably don’t have enough free time to be designing your website from scratch. One place to start is Bandzoogle, which is geared toward helping musicians sell their music and merch. Sign up for the free trial and see if their options—like download codes, shopping cart, site-wide music player—and interface meet your skill level and your needs. There are hundreds of layouts to choose from, with additional customization and design available without coding or software. As far as perks go, the site gives you the option of letting your fans set the price of downloads (which some studies suggests can increase your income), and Bandzoogle doesn’t take a cut of your sales. However, the plans max out at 10,000 mailing list contacts, so this might not be a good long-term solution (or short term, if your band already has a large following). Another great option is Squarespace. There are dozens of templates to choose from, each of which can be customized in appearance and layout. With galleries for photos and videos, music collections, and blogs, showcasing your content is easy. Squarespace has a built in eCommerce option, allowing you to sell physical goods (and it tracks inventory) or digital goods (and it auto-emails the file to the customer). Sign up forms integrate with MailChimp (if you use that to email fans) or into a Google doc spreadsheet (which you can export and upload to your email system), and the contact form forwards to a designated email address. Their help system (both searchable forum, live chat, and ticket system) is impressive. Squarespace currently lacks a site-wide music player (although you can add a player to your footer, if your template has one). You should also noted that Squarespace uses Stripe instead of PayPal; the services are relatively comparable, except when it comes to digital downloads. PayPal offers a lower rate on these, and Stripe (currently) does not. On a $1 download, you either lose $.10 with PayPal or $.329 with Stripe. Like Bandzoogle, Squarespace offers a free trial period; it’s worth testing out and seeing if the features and interface are a good fit for your band. Yola is another option. While it isn’t marketed solely toward bands, it can easily be customized to create a great band website. Wix is yet another option and is similar to Bandzoogle, although it’s not marketed toward bands. Both provide templates and design customization; with Wix, you can completely customize each page using a drag and drop editor. If you’re wanting to keep things super simple (like, just a followable blog to share images and brief updates) Tumblr—one of those previously-mentioned social media sites—allows you to use a purchased domain and your custom URL. When looking for a platform, it’s important to keep in mind your future growth. If a platform doesn’t offer a service you will need, or caps your traffic or storage at or near your current levels, it’s probably not wise to choose it only to change again in the near future. After testing out a few platforms (using the free trial periods that many offer), you probably have a clear frontrunner. If that’s not the case, try narrowing it down to a top two or three platforms, and then ask for feedback from people you trust. Once you’ve selected a platform, congratulations! It’s time to start setting up your site. If you decided to create a band website to own your fan relationships and give your band a committed, professional online presence, you probably want to use your own custom domain. There’s a difference between johnhenryandthecrooners.com (a custom domain) and johnhenryandthecrooners.webuildwebsites.com (a custom sub-domain). With the first, all the focus is on your band, John Henry and the Crooners; people won’t question that the site is official and tied to your band. In the second version, though, the phrase “webuildwebsites” takes some of the attention away from your band, and it might cause people to question how official your site is. Many of the platforms provide default sub-domains for you (as shown in the above sample). Fortunately, it’s relatively easy to register a custom domain. Some platforms, like Squarespace, will even walk you through this process. If you have a existing site, you’ll want to redirect traffic from that site to the new one (once it’s ready). It’s important to set your site structure (page names and URLs) and basic design elements (color scheme, layout, logos) up before officially launching your site. You can set these up during the trial period, or you can set the pages under development as private and create a “coming soon” landing page. This lets visitors know they’re in the right place and that your site is in progress, and it’s far better than making an unfinished site public. If you’re planning on long-term growth and aren’t quite there yet—for example, you haven’t recorded an album yet and are waiting on your t-shirt orders to arrive, so there’s nothing to put in a store—it’s okay to launch your site without that element and then add it when you’re ready. A professional-level band website is a big step to take, but it can make a big difference—both in how the public perceives your band, and in who owns your relationships with fans. 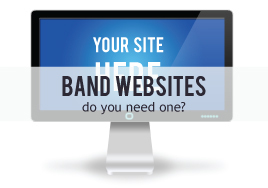 Take a look at where you are as a band and decide if you’re ready to invest in a website. Like many things (free stickers, opening for larger bands for free, ect. ), the return won’t be immediate or direct… but a band website could get you closer to where you want to be. Do you think band websites are essential? Or are you satisfied with social media profiles? If you’ve created a site, do you have tips for other artists setting out to do the same, or are there services you can recommend?